My plan was to write every single day in April, but yesterday I came up short. It was Birthday Eve, and I just sort of melted into the couch with a bowl of pho and season four of Parks & Rec. It had been a long week; my boss has been away, so I’ve been using this bit of down-time to cross a million little things off my to-do list. I have been sweatily productive, even on painkillers. It wears a person out, you know? So, anyway, though I had every intention of remaining committed to this arbitrary goal I’ve set for myself, I vegged out instead and am probably better for it. Fortunately, I have two books to tell you about today! Two books I read in one weekend, back when I had no small person demanding a lot of my time and attention. I read the first book (The Man Who Ate Everything), and liked it so much I went out and bought the sequel (It Must’ve Been Something I Ate) and finished it the next day. 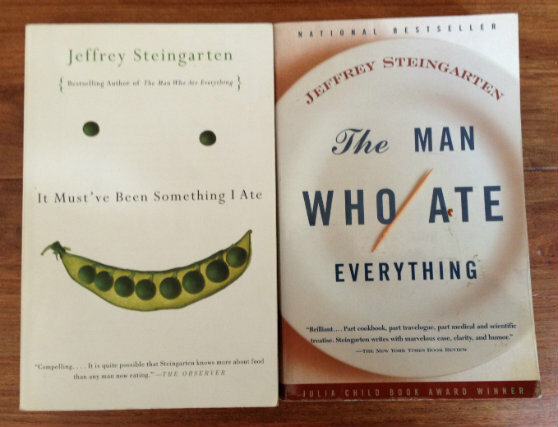 Jeffrey Steingarten, the author of both, is a writer and a curmudgeon. He has been a columnist for Vogue since 1989, and frequently appears as a judge on Iron Chef. He is obsessive, and so funny that even years after I first read the books, when I flip through them again I find myself in tears, laughing until I can barely breathe. Each chapter is its own essay, and each is darkly humourous and self-deprecating and rich with the kind of in-depth information you can only get from someone truly committed to unraveling the science and mystery of a particular dish. You get the history, you get the chemistry, you get the details of Steingarten’s step-by-step process of achieving whatever culinary goal he’s set out to achieve (and eat). The prose is spectacular, and the recipes work. In my mind, there is no other potato gratin recipe than Steingarten’s Gratin Dauphinois, from It Must’ve Been Something I Ate. Using a good dollop of the butter, grease the inside of a 9″x13″ baking dish on all sides. If you have an enamelled cast iron baking dish (I don’t), that’s ideal; if not, glass or ceramic will do. Preheat oven to 425°F. Line your pan with potatoes. You will overlap each slice of potato a third of the way down each slice that comes before it. When you complete the first layer of potatoes, follow a similar process with the second row, this time overlapping entire rows a third of the way over the first row. Repeat with subsequent rows until potatoes are neatly layered. If none of that made sense and you’re sitting here thinking “uh, what?” then just layer the potatoes neatly and do your best. Steingarten’s instructions are detailed, but I am comfortable half-assing these things. Put your pot of milk and spices back on the stove – bring it to a boil once more. When it’s come to a boil, pull the clove of garlic out, and pour the mixture over the potatoes. Bake, covered with a lid or aluminum foil, for 15 minutes. In a small saucepan, bring the wine to a boil over medium high heat. Add garlic, reduce heat to medium, and simmer for two minutes. Add anchovies and olive oil, and simmer for another two minutes. Add butter, and reduce heat to medium low, simmering gently for about 45 minutes, or until the anchovies dissolve. If you are making this in advance, don’t refrigerate it. Just reheat when you’re ready. Serve as a dip for raw vegetables. Don’t mind your breath. What happens if you use a food processor or a meat slicer to slice the potatoes? I use the meat slicer all the time, and have yet to collapse in a heap of shame and self loathing. Also, did he ever fry potatoes in the fat from a horse kidney? Was it worth it? I seems like an expensive way to cook potatoes, especially considering lard is so easy to come by. I need a glass of wine. Laurasmess – They are hilarious! I hope you enjoy them. And Parks and Rec … it is filling the void that the end of 30 Rock left in my life. Is that sad?